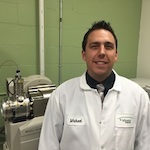 The 2005 Bachelor of Science in Biochemistry graduate is on a mission to create a better patient experience and increase accessibility to preventative laboratory testing. His laboratory is pursuing the development of diagnostics assays that utilize a fraction of the blood needed when compared to historic assays. However, he is careful to point out that this pursuit needs to be executed in a disciplined, scientifically defensibly manner. While at the University of Wisconsin–Madison Department of Biochemistry, Rummel enjoyed the quality of education and access to professors. The Delafield, Wis. native says it was a no brainer to choose UW–Madison and he chose the biochemistry major because of his deep interest in the fascinating piece of machinery known as the human body. After getting involved in undergraduate research in the Department of Anesthesiology and completing the pre-med requirements, he was all set for medical school. However, he ultimately decided that a career as a physician was not for him. Instead, he started a career in analytical chemistry, finding a company that exposed him to techniques like liquid chromatography/mass spectrometry. While at the company, the techniques were growing in popularity and usefulness in the clinical laboratory thanks to their accuracy and specificity. He eventually decided he wanted to build his own facility to harness the technology, and that’s how he joined forces with colleagues to start InSource Diagnostics. His advice for other students is to pursue what they are passionate about because waking up each day excited and thinking they are making a difference is very important.